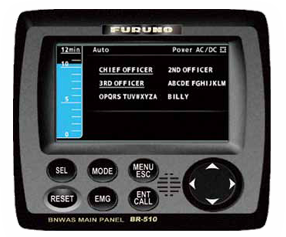 The Furuno BR500 BNWAS monitors the watch officer's presence through watch safety system functions. A watch officer is required to press the button on a Timer Reset Panel or to operate navigation equipment (i.e. : ECDIS, Radar, etc.) at certain preset intervals. If the officer fails to press the button, operate connected equipment or trigger optional motion sensors within preset intervals, visual and audible alarms will be generated in the wheelhouse. If the officer doesn't respond to the alarm, the BR500 transfers the alarm to the Cabin Panels installed in other sections of the vessel in order to inform backup officers of the watch officer's incapacity. Note: Mounting brackets for the BR510 are optional supply. NMEA 2K cables are used to connect the BR500 display to the processor. Only one per system is required, and a 10M length is already included as standard supply. If a longer cable is required, order 20M/30M/40M/50M NMEA2K cable as appropriate. Note: May be used to connect all of the peripherals (BR530/BR540/BR550/BR560/BR570) to the processor.